Marlix's Bow is a very powerful bow that is dropped by Marlix. It is enchanted with Unbreaking V, Flame III, and Punch III - each of these levels is above maximum possible in survival, making this bow very special. It also has Infinity I and Power IV alongside those enchantments. As it has the Final and Soulbound attributes, it cannot be altered and will not be dropped upon death. A bug allowed Marlix Bows with Power II, Flame I to be obtainable. While code should have automatically fixed these, note that you must report it to Senior Staff if you still retain one. Selling them is not permitted. When a Shiny Arrow is fired from Marlix's Bow, two arrows will fire at once toward the target. 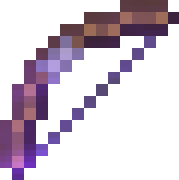 Keep in mind that the Infinity enchantment does not work with Shiny Arrows. You will need to keep a good supply of them in your inventory if you wish to effectively use the ability. boozle628, teamcharger6, Ark_Warrior1 and 4 others like this.